Arcane Transmutation Stone is an item added by the Thaumic Additions mod. It can be clicked on Stone to change it to Arcane Stone Block, it can be clicked on Stone Bricks to change it to Arcane Stone Bricks, it can be clicked with shift on Block of Diamond to change it to Runic Matrix. This to to magic one! "Some researching later you found very interesting way of getting Arcane Stone, Arcane Bricks, and even Runic Matrix! This powerful item stores all primal energy to do some magic easily. To make Arcane Stone click with this item on Stone, same for Arcane Bricks, click on Stone Bricks. 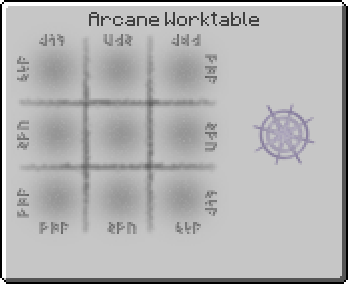 To make Runic Matrix sneak-click the Diamond Block"
Arcane Transmutation Stone has no known uses in crafting. This page was last modified on 20 July 2016, at 16:30.